"Chips" Carpender had participated in the Honduras expedition in 1911 and had commanded destroyer Fanning during the First World War, which was the only U.S. destroyer credited with sinking a U-boat during that war. He was serving in the Bureau of Personnel when war broke out. In July 1942 he was reassigned to the Southwest Pacific Area and was given command of naval forces on the west coast of Australia. Since the only important naval forces in his command were Lockwood's submarines, Carpender was soon attempting to micromanage Lockwood. The two men quickly grew to detest one another, and Lockwood buried himself in a futile project to turn Exmouth Gulf into a forward submarine base in order to get out from under Carpender's thumb. 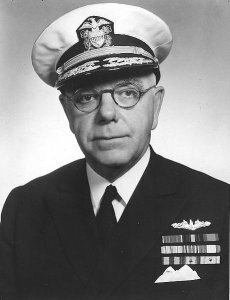 Carpender relieved Leary as commander of MacArthur's naval forces on 11 September 1942. He became commander of 7 Fleet when it was created on 13 March 1943 with responsibility for the New Guinea area. He was relieved of this command by Kinkaid on 26 November 1943, after falling out with MacArthur over the latter's desire to see Carpender operate his ships in the uncharted shoal waters of the northern New Guinea coast.